One of the most amazing visual storytelling tools is the use of motion graphics in designs. They serve to communicate ideas in a captivating, yet brisk manner and keep the audiences engaged. Animations breathe life into otherwise dull and lifeless notions and redouble their impact. From visually appealing websites to product and service videos, animations to movie trailers, motion graphics are all too ubiquitous. Just like every other facet of design, motion graphics are also evolving at a rapid pace. This means that new trends are replacing older ones all the time. In order to create motion graphics that strike a chord with your audience, you should be fully aware of which motion graphic trends are here to stay and which ones are perched precariously on the edge of oablivion. 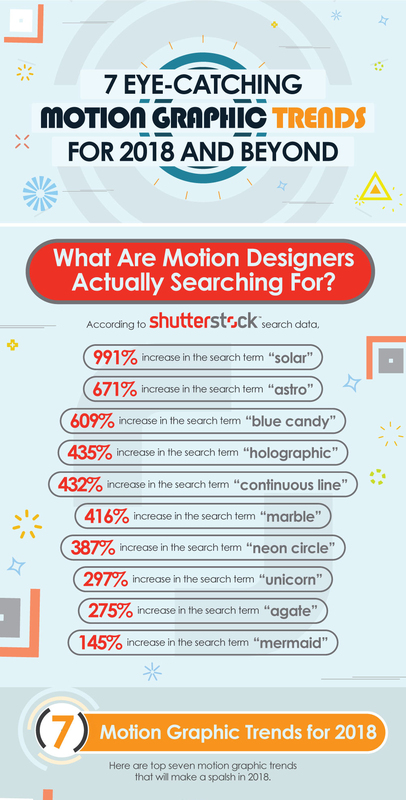 Do you want to know where the motion graphic industry is heading? Which motion trends will create the biggest splash in 2018? Here is an InfoGIFs peeking into the future of motion graphics, identifying promising trends that are projected to dominate in 2018 and beyond.